Washington now accuses Moscow of deploying missiles of this category and declares that, “if Russia continues to violate the INF Treaty, the United States will no longer be bound by this treaty”, ie the United States will be free to deploy ground-based intermediate-range nuclear missiles in Europe. However, a decisive fact is ignored: the Russian missiles (assuming their range is intermediate) are deployed in a defensive position in the Russian territory, while the US intermediate-range missiles would be deployed in an offensive position in Europe close to the Russian territory. It is as if Russia deployed nuclear missiles pointed at the United States in Mexico. As the US / NATO escalation continues, the deployment of such missiles in Europe is increasingly likely. Meanwhile, in early February, Ukraine tested a ground-based intermediate-range missile, which was certainly produced with US assistance. The new US nuclear missiles – much more precise and faster than the Cruise missiles of the Eighties – would be deployed in Italy and probably in Eastern countries too, adding to the B61-12 nuclear bombs that US will deploy in Italy and other countries since 2020. In Italy, the new Cruise missiles would probably again be positioned in Sicily, although not necessarily in Comiso. On the island there are two US installations of primary strategic importance. The MUOS ground station of Niscemi, one of the four on a world scale (2 in the US, 1 in Australia and 1 in Sicily) of the satellite communications system that connects all US forces, even nuclear, anywhere of the world they are. JTAGS, a satellite reception and transmission station for the US «anti-missile shield», which is about to become operational in Sigonella. It is one of five worldwide (the others are in the United States, Saudi Arabia, South Korea and Japan). The station, which is transportable, is used not only for anti-missile defense but also for attack operations, launched from forward-deployed bases such as those in Italy. In the “Nuclear Posture Review 2018″ the Pentagon declares: “The United States commit nuclear weapons forward-deployed to Europe, to the defense of NATO. 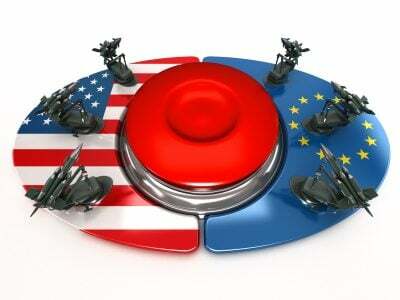 These forces provide an essential political and military link between Europe and North America”. By linking us to their strategy not only militarily but politically, the United States increasingly transform our country into a forward-deployed base of their nuclear weapons pointed at Russia, therefore into a forward-deployed target at which Russian nuclear weapons are pointed.